Fleas are small, jumping parasites that are a nuisance to pet owners everywhere. Once one appears, it often means there are thousands more in your home or yard. It is important to control flea populations, as they spread disease, illness and infection from wild animals to household pets. 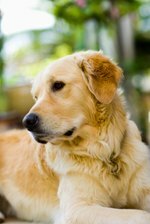 Sulfur-based products are used in some circumstances for the removal of fleas; however, not all sulfur products are effective for flea removal. Sulfur powder is used successfully in yards to deter and kill off flea populations. It should be noted however, that sulfur is damaging to certain ornamental plants or vegetables. Some sulfur powders may be need to be mixed with water and then sprayed onto the lawn for maximum effectiveness. It is important to always follow the product manufacturer's recommendations. Some sulfur products may be hazardous to a pet's health, so be sure to choose a product that is pet-safe if dogs or cats will be allowed out into the yard. Homeopathic and natural enthusiasts often swear by the use of sulfur and other supplements for deterring fleas from their pets as well as for improving the overall health of their pets. Add nutritional into a pet's diet by sprinkling into food or water or giving it as a tablet or pill. Sulfur supplements should only be given under the recommendation or approval of a veterinary professional, as some pets may have a poor reaction to sulfur or the chosen product. Sulfur candles are used to kill fleas and other pests including wasps, moths, ants, mosquitoes and house flies. Some candles do not leave behind any unwanted smell, but others produce a rotten egg smell. Use sulfur candles in outdoor spaces, but they are not recommended for indoor use for killing fleas as they discolor items within the home. Sulfur-based shampoos are not prescribed for flea issues, but rather for issues involving parasitic mange mites or skin issues due to seborrhea or fungal infections. Likewise, sulfur dips and powders are used for mange mites or lice, but are not recommended for use with fleas.